The highlight of the 2011 nesting was that the owls finally moved to the previously unused nestbox on the cooler north wall of the barn. The bad news is that it took a nesting failure in their traditional box on the south wall to cause them to move. The first nesting and resulting fascinating behavior of the female is described at the bottom of this page. 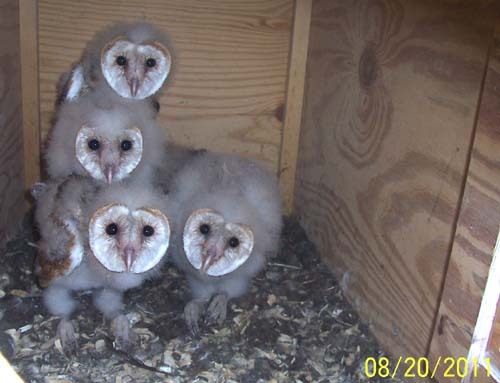 The owls immediately moved to the north box on May 26, the evening after the nesting failure in the south box. Eggs were laid on June 9, 11, 12, 14, and 17. The eggs hatched on July 9, 11, 13, 15 and 17. On July 22, afternoon box temperature reached 104 deg. F while the outside temperature was 99 deg. 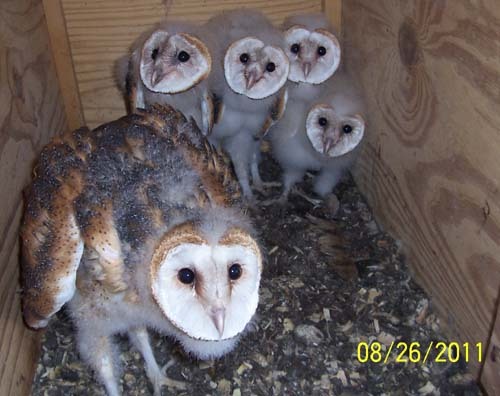 F. This was the hottest box temperature during this nesting and the owls seemed unaffected, other than exhibiting the usual beak clicking to keep cool. Temperature in the old south box would have been at least 10 degrees hotter. At one point during this nesting, the male appeared to have disappeared for two days, but resumed bringing prey on the third night. On several other nights, so many prey items were being brought in rapid succession that I suspected a third owl was helping, but the low resolution images from the motion detection capture device didn't allow verification of this. Normally, when I open the box to take the daily photo, the nestlings move to the opposite end of the box until a certain age when the oldest ones feign aggression toward me. On August 25, the oldest nestling moved toward me for the first time. However, on September 4, an unusual behavior was observed. One of the two older nestlings moved forward and the other displayed aggression toward him. No contact was made between the two and the older nestling seemed oblivious of his siblings action, instead focusing his attention on me. My guess is that the aggression toward the other nestling was meant to demonstrate his prowess to me while remaining at a safe distance. But, I'll leave that to the animal behaviorists. When I closed the lid the aggressive action immediately stopped. 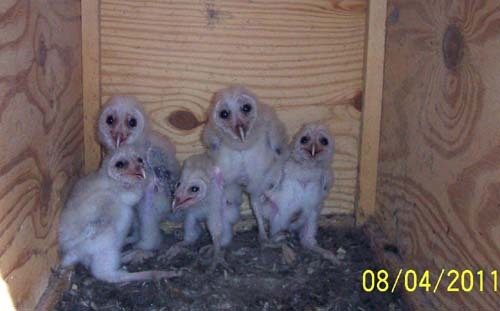 I had never before seen even the slightest display of aggression between barn owl nestlings. 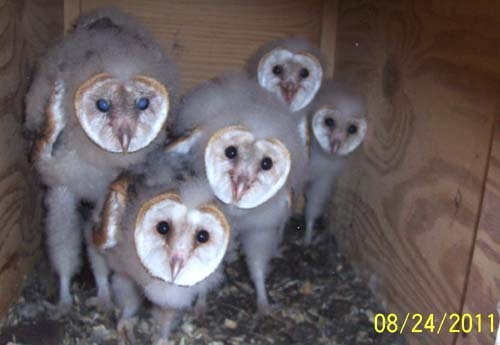 Usually the first owls to fledge spend one or more days away from the box and then often return for a day or so. When fledging from the south box in previous years, they often roosted in the nearby white pines and the adults delivered prey to them there as well. 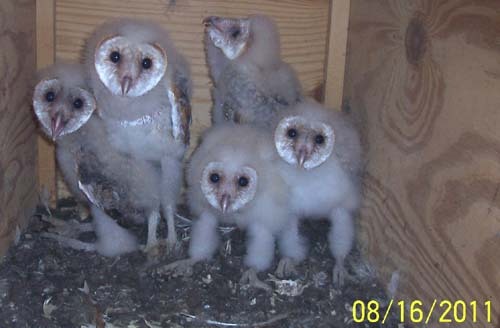 However, as this brood fledged, most returned to the nest box or entrance perch each night to be fed. 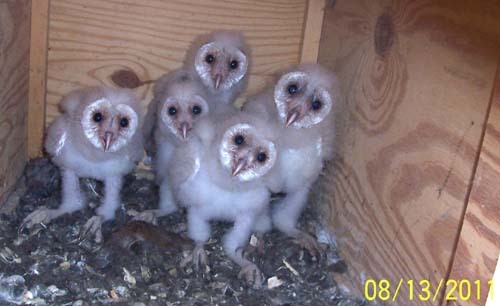 As late as October 7, all 5 fledglings returned to the box to roost. Three were in the box on October 29, when we had an early snowfall. The adults had finally stopped bringing prey to them the night before. The last owl left the box on November 4. Our owls' traditional nest site for the past several years has been a box mounted high inside the south wall of the barn. This location tends to overheat and has required careful monitoring of nestbox temperature during summer nestings. One particularly hot year I had to use a small exhaust fan mounted on top of the nest box. But, usually keeping upper windows open and occasionally using a large fan to circulate hot air trapped under the roof worked well. Several years ago, a second nest box was placed in a cooler location inside the north wall, much lower down the wall than the south box. There were never signs that owls were using this box. The original wood chips remained undisturbed year after year. On February 27, a barn owl was recorded on the perch of the south box. 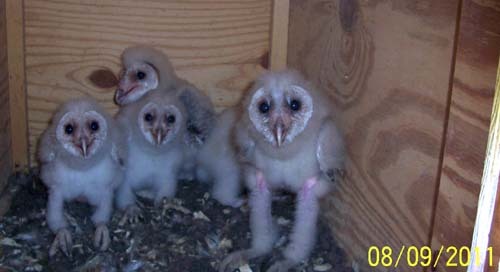 On March 16 one owl entered the box and remained 5 hours. The next night, both owls were in the box most of the night. Good! An early nesting would mean heat would not likely be a problem. Their first egg was laid April 15. The clutch of five eggs hatched May 15, 18, 20, 22 and 24. On May 25, the outside temperature was in the 80's, which shouldn't have been a problem, since the top window near the nest box was open. The thermometer inside the box wasn't visible in the nest cam and I had not adjusted the camera to show the thermometer since that would cause the female to leave the box. Video that afternoon showed the female near the entrance and all 5 nestlings dead. Previous broods had easily weathered much hotter outdoor temperatures, but this time a small piece of plywood was covering the 6" vent hole in the box lid previously used for an exhaust fan. There were still several rows of 3/8" vent hole in the lid, but that must not have provided enough air flow. That evening, as soon as it became dark enough for the female to leave the box, she picked up one of two dead voles in the box and flew off, returning in a couple minutes to pick up the second vole and fly off with it. Returning just as promptly, she then flew off with one dead nestling and then a second. Next, she simply pushed two more nestlings out the entrance. She apparantly decided the oldest nestling was too large to struggle with and leaving it, left the nest box, never to return. The next day I checked the north box and was amazed to find the two voles the female had removed from the south box. 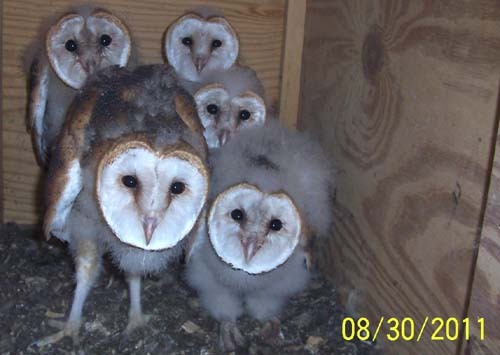 A camera was fitted on the north box and that evening, both owls frequently visited the box throughout the night. They had obviously been quite aware of this box, probably for years, but it took a nesting failure to cause them to move. The door is now permanently closed on the south box so a future owl pair won't use it. 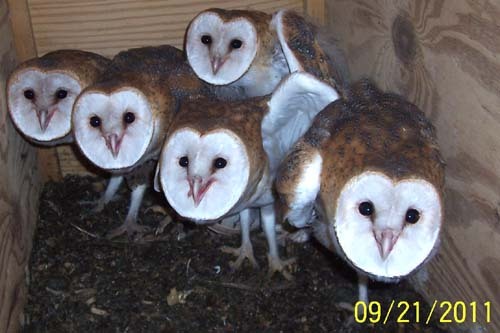 As I write this, on April 1, 2012, the owls are again nesting in the north box and their sixth egg was laid today. Last year, the daily maximum nestbox temperature in the north box never varied more than 4 degrees from the outside temperature, and, during the hottest days, was sometimes cooler than our house. While the owls don't have the benefit of a window fan or the ability to sweat, I, at least, don't have to sit in my office bill clicking on the dog days of summer. A camera and motion detection capture box was first fitted on the rear of the box, directly across from the entrance. Early in the nesting, the female and young nestlings remain at the end of the box away from the entrance, so the male, or later, both adults are in full view when entering the box with prey in their beak. 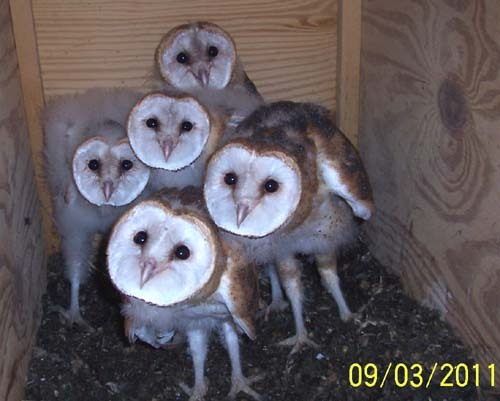 Later the older nestlings move near the entrance and block its view, so the camera was then mounted on the outside wall of the barn, focused on the entrance perch. A small light was then mounted on the wall to provide more illumination, since the infrared source was too dim at the greater distance. The graphs on the following page depict prey data from July 9, when the first egg hatched to October 27, when the adults stopped bringing prey to the box. The total prey items recorded brought to the box during this period was 792. However, 15 nights during this period were not recorded due to power failures. A momentary power interruption, usually during a thunderstorm, would stop the recording. 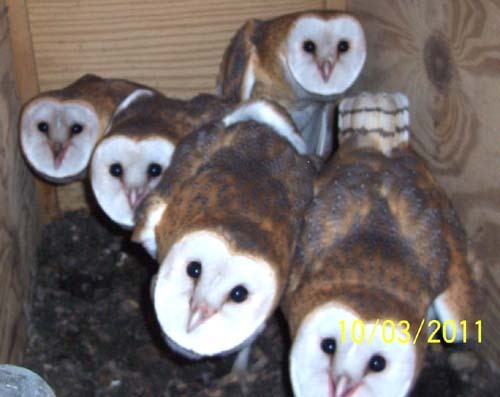 Estimating what the adults consumed while away from the nestbox hunting, and what was brought to the female while incubating, as well as the 15 unrecorded nights, the owls easily caught over 1000 rodents during this nesting. And, of course, they eat every day of the year. While the purpose of the prey cam was to log each prey item brought to the nestlings, it also captured interesting behavior of the nestlings when they began to venture out onto the perch. Watching as many as four still clumsy nestlings try to maintain their balance on the same short perch was amusing. But, even more interesting was observing the way a fledgling on the perch reacted to a thunderstorm. Actually, it didn't react at all. The storm was directly overhead, with very loud thunder and blinding lightning. The owl was alone on the perch, busily preening and waiting for an adult to return with dinner. It showed absolutely no response to the violent storm. There had been several previous storms during this young owl's life, and it apparently considered this one of no consequence. It seems the owl brain is very good at blocking out irrelevant information - much more so than mine. COPY; 2012, American Artifacts and Richard Van Vleck, Taneytown, Maryland.